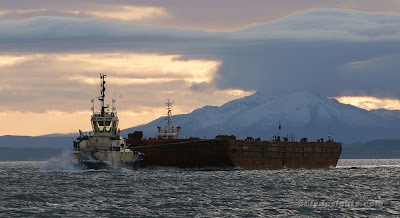 The Clyde tugs AYTON CROSS and SVITZER MALLAIG headed for the Largs Channel this afternoon to tow the barge AMT DISCOVERER from Fairlie, where it had arrived on Wednesday, upriver to Ferguson Shipbuilders' Newark Shipyard at Port Glasgow. The trio are seen here approaching Cloch Point in the fresh northerly breeze. Fantastic light in this photo, very nice indeed!